Army Staff Sergeant Marcos Jimenez joined the military to serve his country and to make his family proud. 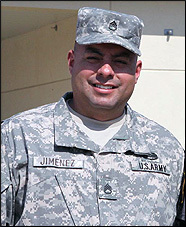 Staff Sergeant Jimenez was severely wounded on the morning of March 19, 2011 when the armored truck he was in was blown up by an improvised explosive device in the village of Pakhabe’Shana in Logar, Afghanistan. After being dragged out of the twisted wreckage barely conscious. Staff Sergeant Jimenez was evacuated by helicopter. He had multiple traumatic injuries and was comatose. He suffered a spinal cord injury, a fractured right tibia, a fractured left arm, and facial fractures. The damage to his right leg was extreme, but his leg was salvaged. He also suffered a traumatic brain injury and has been diagnosed with post traumatic stress disorder. Among the commendations awarded to Staff Sergeant Jimenez were the Purple Heart, Bronze Star, Afghanistan Operation Enduring Freedom Medal, Army Commendation Medal (4x), Army Good Conduct Medal (6x), Iraq Campaign Medal, Professional Development Medal (3x), and the Combat Action Badge. Building Homes for Heroes gifted Staff Sergeant Jimenez, his wife Lucia, and their five children a home in Murrieta, California in December of 2014.